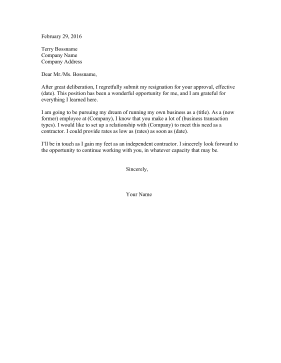 When resigning to start an independent company, use this resignation letter to offer your former employer contract opportunities. After great deliberation, I regretfully submit my resignation for your approval, effective (date). This position has been a wonderful opportunity for me, and I am grateful for everything I learned here. I am going to be pursuing my dream of running my own business as a (title). As a (now former) employee at (Company), I know that you make a lot of (business transaction types). I would like to set up a relationship with (Company) to meet this need as a contractor. I could provide rates as low as (rates) as soon as (date). I'll be in touch as I gain my feet as an independent contractor. I sincerely look forward to the opportunity to continue working with you, in whatever capacity that may be.